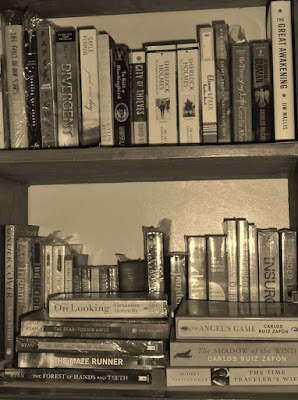 And so I thought of sharing with you how my book collection grew over the years. My book-buying habit changed over time. I am not really a book hoarder but I used to buy books even if they are not on my list or just whenever I have this strong urge to buy books. And then my TBR pile would go up. Now though, I can fairly control my buying habit in the sense that I don't impulsively buy books especially when I know that I will not be able to read them in an immediate future. I do slip from time to time. But it's not as crazy as before. Haha! I try, as much as possible, to concentrate my buying during book fairs and warehouse sales, except of course when there are book signing events I want to attend to. And, I stick to my list. I do my best to stick to my list. Haha! I have to opt to double layering of books in the left bookcase because I'm running out of space. Hopefully, I will have my new bookcase soon. How are your bookshelves folks? And what are your buying habits fellow book lovers?